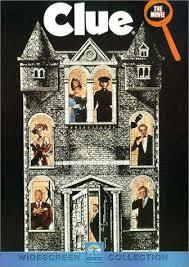 A very fun time, this murder mystery in a mansion, on a stormy night, is a classic of both comedy and suspense. This is the ultimate combination of murder in a mansion suspense and witty strangers meeting for the first time comedy. It’s got the best of all worlds, including Agatha Chrystie stories put together in one, and even the use of alias names, like in Reservoir Dogs. at the heart of the film is a situation where people keep getting murdered and the only thing obvious is that one of the people at the party is the killer. The movie has fun exploring the mansion, revealing secret passages, and unfolding one twist after another. It doesn’t hurt that there’s an all-star cast of talented actors from the seventies and eighties on hand here. This movie is a classic. 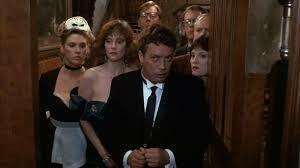 Clue is one of those great movies that seems like it’s based on an Agatha Christie book and combined with comedy. Christie wrote two books, which this movie seems to be a sort of melding of. There’s murder on the orient express, where a bunch of strangers on the same train all took part in the murder of a passenger. Then there’s and then there were none, where a bunch of strangers got invited to a mansion for a weekend, and started being murdered, one by one. This movie takes both of those storylines, mixes them together and throws comedy into the mix as well. The result is an absolute gem. The movie opens with shots of the dark and stormy clouds forming, along with some fantastic, fast moving music. This music is so quick and pumping with energy that it is reminiscent of the Bernard Herman Psycho music featured when Marion Crane is driving around on a dark and stormy night. Here, the music plays as multiple characters drive up the mansion, get out and meet the butler, Wadsworth (Tim Curry) who greets them at the door. We even get a scene of one character’s car breaking down and her being stranded on the side of the road until another guest pulls up to help her out. Once inside, the guest’s move from the study to the dinner table, where they discuss who each other is and what they all know about the others. The one thing about this is that it’s a sort of mystery guessing game with nobody really wanting to reveal anything about them. And yet, the time period that the movie is set in really comes out here, with all of them being involved with government jobs. The year is 1954, as the opening titles tell us, and it’s the same year as the McCarthy hearings and the red scare about communism. This movie uses that time period to drive its plot. After dinner, the characters move back to the study where wasworth finally explains what they are all doing there. The one thing that each and every one of these guests has in common is that they are all being blackmailed. Their blackmailer is also there, among them. It is the man who was the last guest to arrive, and possibly the owner of the mansion. His name is Mr. Body, and the details of his character are never made clear. This is intentional of course, as the movie knows that the more curious we are, and the less they tell us, the more mysterious the film will feel. After it is revealed that Mr. Body is the one who has been blackmailing them, he shows them that he’s got a few tricks up his sleeve as well. Mr. body came prepared with individual bags filled with weapons, a different one for each guest. They open their weapons, the lights go out, and Mr. Body is murdered. Now the real mystery has begun. From here, the characters go running to check on Yvette, the maid, who is screaming because she is alone in a room, and terrified that the murderer might come after her next. When the characters return to the study, (this time with Yvette), they find that Mr. Body is gone. Perhaps he wasn’t dead to begin with. The only other person in the house is the cook, and so they go to check on her. She has a knife through her back. The characters reconvene in the study to discuss options. Wadsworth informs them that the police have been called and they decide to lock the weapons up in a cupboard and try to figure out who the murderer is. When they find Mr. Body, this time definitely dead, and then a motorist shows up at the door wanting to use their phone, the characters decide the best idea at this point is to split up into pairs and search the house. This is the halfway point or so of the film, and it’s nice to have a sort of change of pace. So far the characters have pretty much been confined to the study, the dining room, and the kitchen. Now, for the first time, we get to explore the rest of the house. Each pair of characters takes a different floor. There’s the attack, top floor, the bedroom second floor, the entertaining rooms, first floor, and then the basement. We get to see all of it. Things get even more interesting when the motorist is killed and a cop shows up, wanting to use their phone as well. The characters need to even put on a show, conducting a fake party in order to fool the cop into believing that everything is okay. Throughout all of this, including the characters going back to search the house, secret passages are revealed which go through the walls in order to connect one room to another. These passages involve fireplaces and paintings that spin around and are fantastically fun. 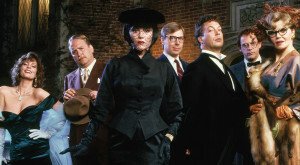 Clue has a lot going on with mystery, but there is also so much more. There’s the comedy element, which is sometimes a little forced, but at other times, extremely funny. This movie has a sense of sound and wording, such as one where characters play a yes or no game regarding whether or not someone else is or isn’t in the house with them. Aside from the comedy and mystery there’s the dark and stormy night trapped in a mansion atmosphere, and also the fantastic fifties songs that are thrown in here at the most perfect of times. From “shake rattle and roll,” to “life would be a dream,” the music is spot on. To top it all off, there is a fantastic device used at the end to give us three different possibilities of what might have happened. Each one of them involves running through the events of the evening and showing us the clues that we might not have noticed earlier. This movie pulls out all the stops to really deliver both with suspense and comedy.